Let me just say right away: I am not a runner. I think the last time I purposefully ran was freshman year, and I regretted every moment of it just because it hurt. all over. I won’t even hurry up to catch my friends if they walk obscenely fast – I’m a big believer in getting there when I get there, and not a moment sooner. But, I support and am so impressed by people that are runners. I think my running genes were edited out sometime over a hundred years ago, as nobody in my extended family are runners either, on either sides. Well, my brother tried for a bit in middle school before genetics reminded him he’s really better suited for powerlifting and football. It’s really amazing, what the human body can do, and runners show that – I mean, alongside everyone else that uses their body for more than just getting around, like me. 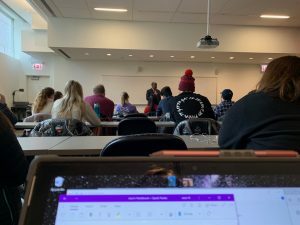 So as a part of my sorority and as a personal interest, I volunteer twice a year with the Bank of America as they host their runs: the Bank of America Chicago Marathon in the fall, and the Shamrock Shuffle in the spring. 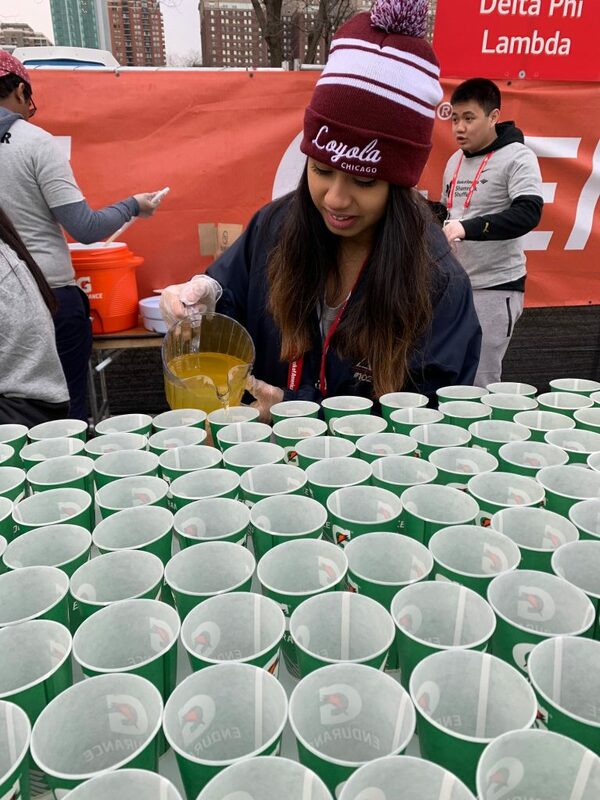 Usually we’re tasked with handing out water or Gatorade, and also cheering on the runners, which is the most exciting part for me. I love cheering. 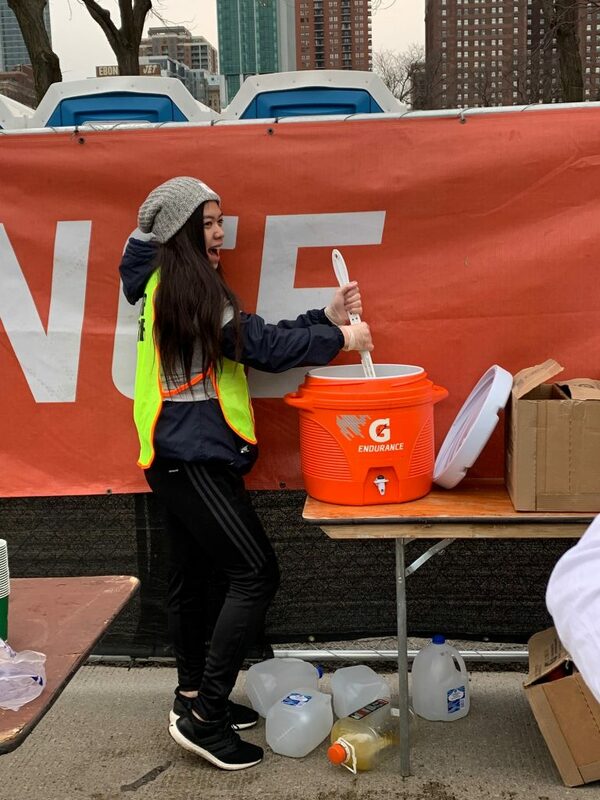 Here are my sisters making and pouring the Gatorade before the runners started winning. We eventually had to dump it all – they never told us!, I’m not sure why, but it was … interesting to watch anyway. I don’t drive in Chicago, but I can imagine drivers do have to take note of the days, since both runs close down streets for the runners. I mean, the Marathon is a marathon – that’s like 26 miles folks – and the Shamrock Shuffle is an 8k, but both are impressive feats. You can volunteer at either run as an individual or with your group! Or, you know, you could run. Or watch! These runs are part of the Chicago landscape like holidays and Cubs games. If you come to Loyola, take some time and experience them! 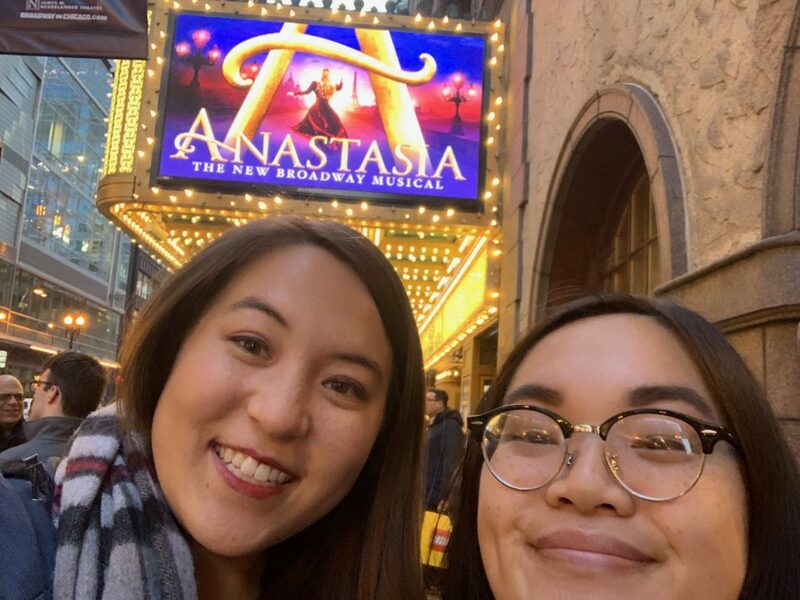 Chicago knows its business about a lot of things – and one of those things is definitely theater! So, every year for the graduating seniors, Loyola gives discounts and puts on a few special events. This year it is a boat cruise, a Cubs game, a special Senior Toast, and a viewing of Broadway’s Anastasia! Of course I had to go. Theater can really rack up, which is why I seized my chance to see one of my favorite movies as a play for more than cheap. There are a lot of amazing student discounts, like a student ticket price for the Joffrey Ballet (I went and saw them last year put on a production of The Nutcracker, but set at the exciting 1893 World’s Fair that took place here in Chicago) or special discounts at smaller venues too. 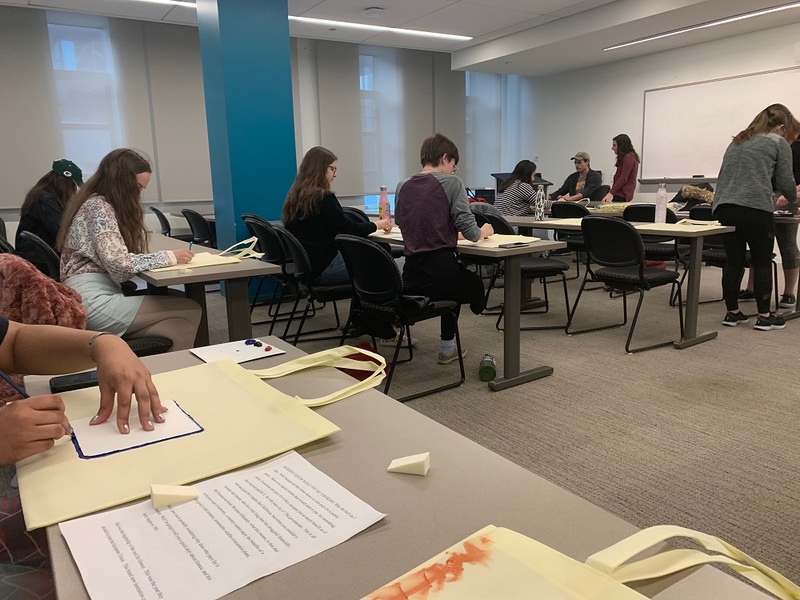 Different Loyola programs also sponsor trips to relevant shows – in my freshman year, the Honors Program took us to see Galileo at a tiny theater near DePaul University. It was alright, but made better by the fact we were studying him at the time. 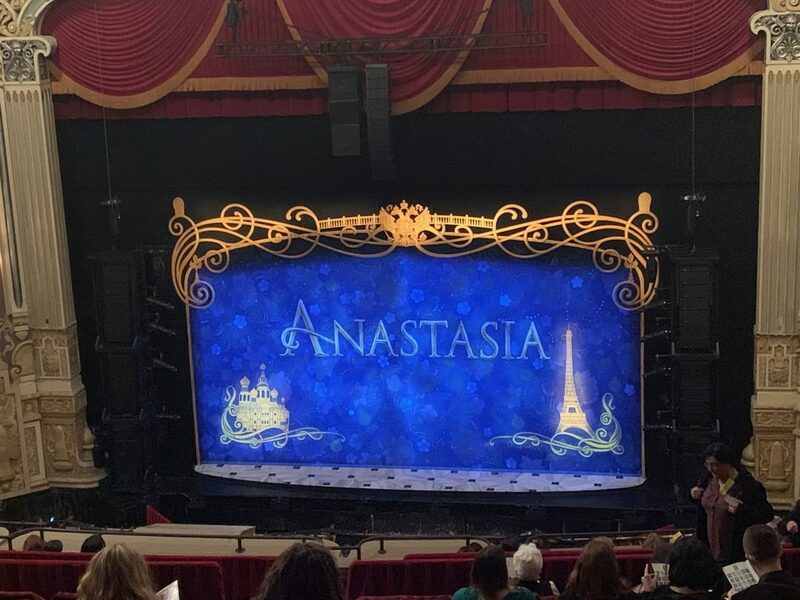 So yes, Anastasia. If you get a chance, I’d recommend it! It was held at the old Oriental Theater, now the Nederlander, which is so beautiful and a work of art on its own. Although the musical cut out my roommate’s favorite parts (the Rasputin parts, which I always found a little too scary and creepy for my liking) they added in more Russian-Revolution bits and the impact it had on the aristocracy and how the aristocracy impacted it, although of course it was still very much pro-royalty. I mean, who doesn’t want to find out they’re actually a lost princess? You know? I couldn’t take pictures during the show – nor would I, really – but the costumes were absolutely fantastic. I was utterly distracted by all of the shiny things that sometimes I forgot to listen to the music! It was mostly the same songs, plus some more new beautiful ones, if I remember the movie correctly. This is all to say that I love theater, Chicago loves theater, and even if you don’t, if you spend any time at all in Chicago I recommend you try something. After all, there’s not just this Broadway stuff and Shakespeare – there are troupes that specialize in satire, improv groups (improv Shakespeare anyone?) and some, like the Splatter Theater for a bloody Halloween, that make things exclusively for holidays. Chi-rish: what in the world? You know what they say, that everyone is Irish on St. Patty’s Day? Chicago loves that saying, and totally agrees. 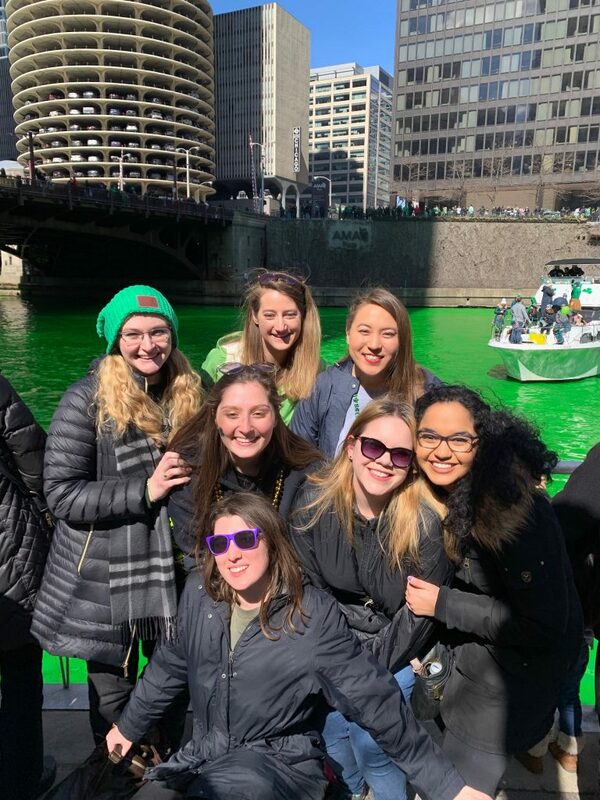 This year was my first St. Patrick’s Day in Chicago, since my freshman and sophomore year it was over Spring Break while I was away, and last year I was abroad in China where only the expatriates celebrate. So I had to take advantage of that fact this year! I’m so glad I have my friends. This group is me and friends from freshman year, including my roommate Olivia (in the center, with the shades). Chicago celebrates the holiday with lots and lots of revelry, from costumes to contests. I saw lots of people dressed up as St. Patrick himself, some knitted red beards, glitter, green on every piece of clothing imaginable, and plastic hats galore. To be honest, I didn’t have any green, so I knitted myself a green headband the night before. It’s not pictured because I was wearing it as an armband at the time, but I promise I was wearing it! Most notably, Chicago dyes the river green. Check it out! These really cool people (peep the person in the all-green suit) came by and tossed beads at us like it was Mardi Gras, and every one of our group got one, so that was really cool. But seriously, the river! Actually, apparently they dye it yellow, and science makes it green, but it’s totally safe for the environment and fades away after a week or so. How it works, I have no idea, but it’s so cool. You can get up and watch them do it, around 9am, but I certainly did not. It’s a weekend! That’s sleep-in hours! We went down there around noon, hoping to get a glimpse and catch the parade, too. Well, the reason why I don’t have any pictures from the parade is because I missed it! Yeah… we got too excited and went to go see the river first, and by the time we remembered the parade, it was over. But that’s alright, since we could see some of the parade members in the crowd, like clowns and dancers and so on. 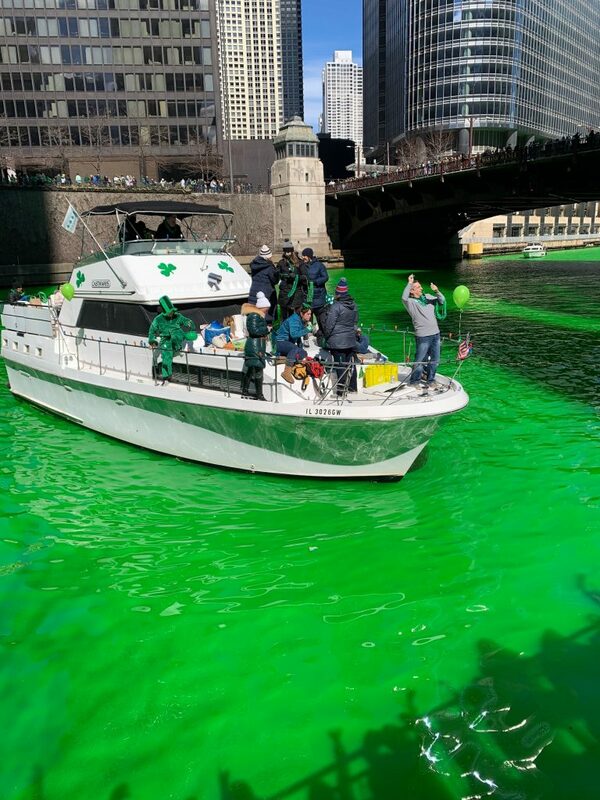 Chicago’s Irish population is really proud of their heritage, and Chicago’s non-Irish are proud to have them, leaving Chicago excited for this day every year. I ran into like five different friends downtown, which is pretty rare because it’s a large city! Next year, what will you be doing to celebrate the day? Did you know Loyola has a club on campus dedicated to sustainable living? Well, actually, we have a bunch. The Growers’ Guild is one such example, and they’re passionate about helping the environment by cutting down on waste – and having a good time with it, too! 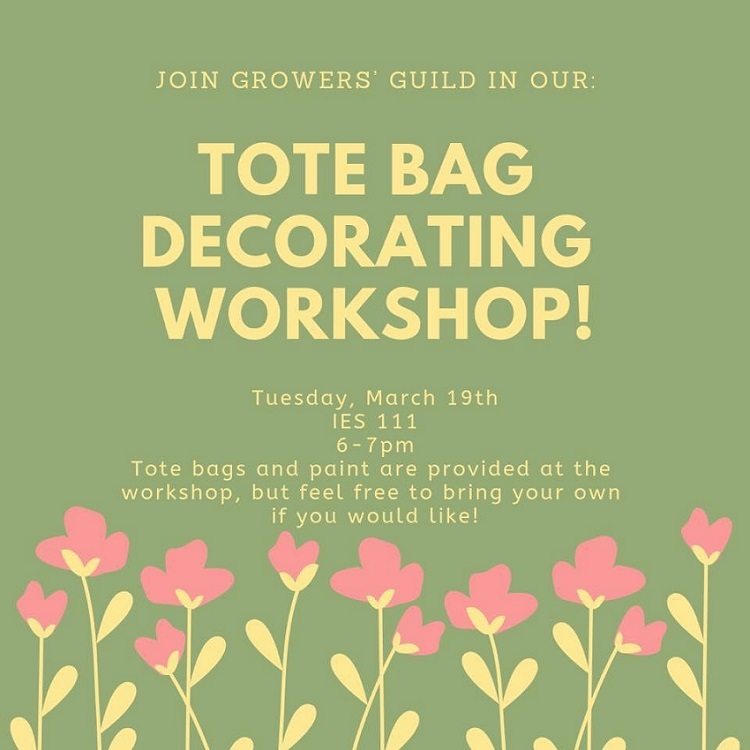 The Growers’ Guild has lots of fun events throughout the semester, including painting mugs, a free clothing swap, and their tote bag decorating night, which is what I attended this past week. My ‘action’ shot, the picture I remembered to take before my hands got full of paint. After, though? I didn’t touch my phone until I scrubbed my hands clean. And by that time everyone had left! Although I had never been to a Growers’ Guild event before, due to schedule issues, I have seen them all over Facebook. That’s one of the main reasons I love Facebook nowadays – it keeps me so in the loop! It seems like a lot of people respond, so my roommate and I thought we ought to go early, in case they run out of supplies. I have to admit, it wasn’t necessary, which was a bummer. Although a lot of people came, we were the first ones! We beat the paint arriving, actually, so we had a lot of time to chat with the Guild members and didn’t get any sort of head start on painting over the other attendees. It was really interesting to talk to them! I was sad that I wouldn’t be able to go to a lot more in the future, as the school year winds down and I’m graduating. I sure missed my chance! … But it’s alright, since I got to go to this one. I went in with the mindset of painting for fun, without any plan at all, so check it out: this is my creation! Instead of brushes, they had sponges, so I thought: well, here’s an opportunity! And I scribbled around. And then it looked a little empty, so I filled it with a Hozier quote. Hey, nobody calls me an artist! 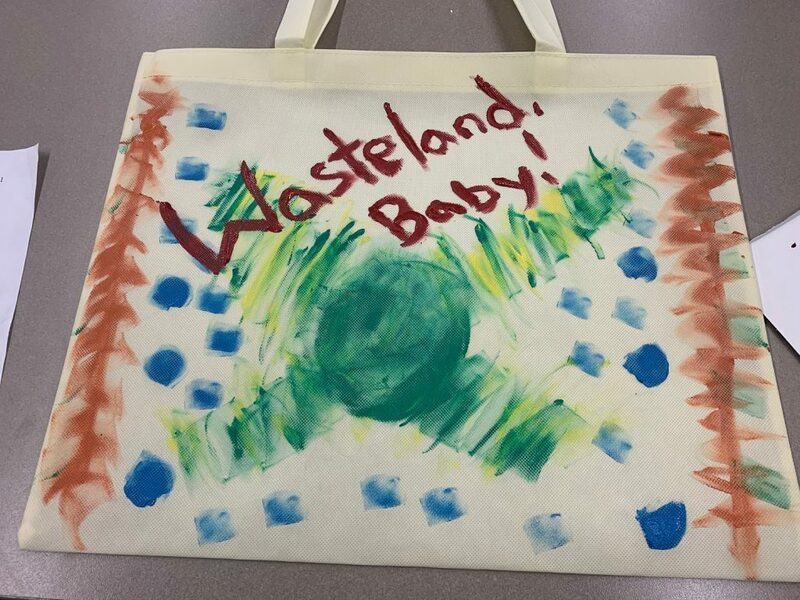 What do you do for sustainability, or how do you care for the environment? Boy do I have a restaurant I want to tell you guys about. Like a few of the others I’ve mentioned, it’s ‘local’ in the sense that it’s in the Chicago region, although many native Chicagoans will tell me that it is most certainly not in Chicago – it’s in Evanston. 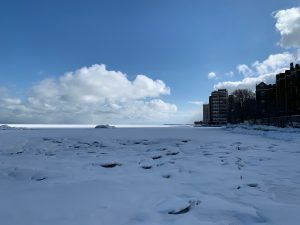 I’m pretty sure there were locations actually in Chicago, but I went to the Evanston one to make an adventure out of it. Sushi Burrito, ever since I heard of it, really piqued my interest. I mean, what could be wrong about taking a sushi… and making it huge? Well, lots of things, some people told me – firstly, that it was too big to get your mouth around so you were left without the greatest quality of sushi. They mean, of course, you get all of the flavors in one bite. Which is fair, of course. But I still wanted to try it. The second complaint was that it was too big to eat at one sitting but unlike a regular burrito it wasn’t good as leftovers. This, I ignore, because I was determined to eat it all. As one does. After a few years of not going, I finally got around to going to it recently. It was late in the evening, so I didn’t get a chance to drop by my other favorite places in Evanston, such as the bookstore that charges by weight like a deli, or the huge Barnes and Noble, or get bubble tea from Joy Yee’s, and so on, but that was fine. I had a great time at Sushi Burrito. This is their website: https://sushiburritochicago.com/ I got the Chitown (I think), pictured below, because I asked the guy at the counter what was the most popular since I certainly couldn’t decide with so many options. 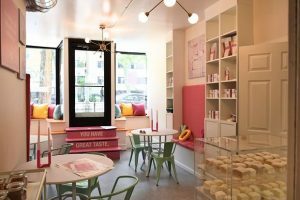 Plus the cost – not too bad! 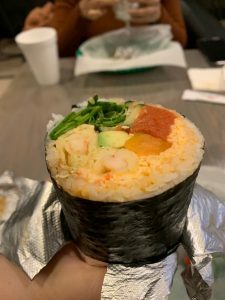 Overall I would recommend Sushi Burrito if you’re looking to try something unique. It’s a little far away to go often, but how fun! Playing bingo for a good cause? Sign me up! In 2011, Loyola student Emily Johnson passed away from a sudden stroke. Among her activities she was involved with on campus, she was a sister of Phi Sigma Sigma, a Panhellenic sorority on campus. So every year they raise money to donate to Rush Hospital, where she was taken, and talk about the warning signs of a stroke to students on campus. 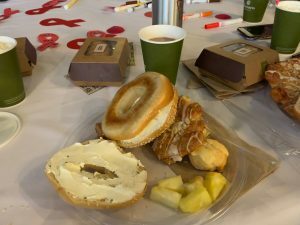 The culmination of their efforts is a Brunch and Bingo event, held just this past Sunday and catered by Panera. A $5 entry fee – or $15 if you also wanted a t-shirt – nets you the brunch and two bingo cards. The food was so delicious, as is expected of Panera. And the whole of Rambler Room was packed, which made me glad – I’m sure Phi Sigma Sigma raised a lot of money and was able to help out a lot. All of the sisters were wearing red and white, and the tables were, as you can see in the picture, filled with red bows with FAST written on them – the acronym for stroke warning signs. Facial drooping. Arm weakness. Speech difficulties. and Time. All things to keep in mind when you may be having a stroke or seeing someone else – the imperative is to get them hospitalized if the FAS in FAST is noticed. When it came to the bingo – I actually won! They hadn’t exactly calculated for two winners, so they only had three prizes left for the three rounds left (I don’t really know what was going on, it was possibly one of the most confusing rounds of bingo I’d ever played) so the other winner and I flipped a coin and she ended up with a bag of coffee beans and I got four free sandwich coupons to Potbelly’s. Seeing as I gave them to the friends I had gone there with and we made plans to go eat using them later, I think I was the real winner. But that’s beside the point. In addition to prizes, they also had a raffle to call winners who could then purchase bigger prizes, like a signed Blackhawks jersey or tickets to a Bulls game. All in all, it was a lovely morning, and I’m glad my money was well-spent – both on breakfast for me, and for Rush Hospital, doing good in the world. 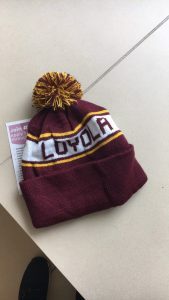 I love my Loyola gear. In my freshman year, I must have gotten like ten or so free tshirts just by going to different events, and it’s a great story to tell. And my collection has only grown from there. I’ll admit, it’s not the largest collection – a lot of the shirts from freshman year are now tired from being my workout clothes, but I try to get a new piece of gear every year. I got a scarf during my sophomore year, and since I was abroad my junior year (although I did get gear from both universities I went to) I made up for it by getting two things this year – a new hat, and a fleece jacket. Yeah, it can get a little chilly here, so I gotta get things that can keep me warm, right? But how, you might ask, do I get… more? And for cheap? The bookstore can run pricey, I know. 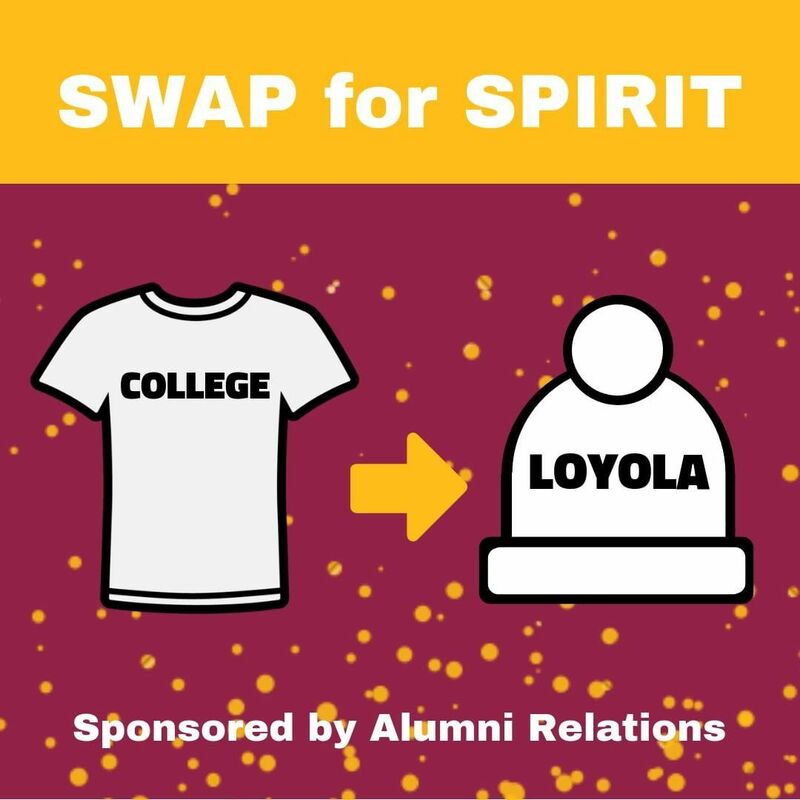 There are two ways a lot of students get their gear – going to sports games where they hand them out for free, and going to Swap for Spirits! Sports games are nice because you usually just have to be one of the first 500 students or so to show up, which isn’t that hard. My roommate must have three or four Loyola hats just from doing that. Swap for Spirits, on the other hand, is way faster. You can take any piece of clothing – it says other universities, but I had a really good friend who just traded in a plain white shirt, and they’ll replace it with Loyola gear! Just last week, Alumni Relations had one for hats. Cute, right? Easy as pie. That’s Loyola for you!